Acer griseum boasts tactile, cinnamon coloured, peeling bark, hence the common name, Paper bark maple. Translucent sections of paper-thin, peeling bark curl up and stay attached to the tree, giving year-round interest but especially winter interest. The attractive foliage has three leaflets and is a good bold green, turning a firework display of colours from pink to bright red before falling in the autumn. This slow growing, small Acer tree reaches a height and spread of 5 x 4 metres in 20 year and is suited to small gardens. 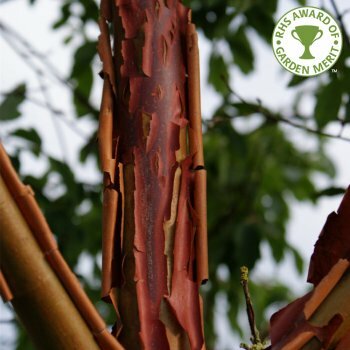 Acer griseum has the RHS Award of Garden Merit and will grow in both sunny or partially shaded locations. It will do well in most well drained soils, but do avoid a very exposed position. Interesting fact: E H Wilson brought Acer griseum to England from China in 1901. The tree in Westonbirt Arboretum is believed to be a Wilson original. Our pot grown Paper Bark Maple trees can be planted at any time of the year. Prepare your planting site by removing weeds and grass within a metre of your desired planting hole. Dig a square hole as deep as the root mass and roughly 2x as wide. To help the tree establish more effectively, sprinkle root grow in the hole. We recommend planting Paper Bark Maple trees (except multi stem forms) with a staking kit. For single stakes, knock the stake in at an angle and use a buckle tie with a spacer to prevent chaffing. For further advice, visit the help section. If you’re planting Paper Bark Maple trees in spring or summer, water well for the first few months. Increase watering if there are extended periods of hot or dry weather. If planting in autumn, you may only need to water a little. Paper Bark Maple trees are easy to look after as they do not require a lot of pruning. Remove any damaged or diseased branches when the tree is in leaf or just after leaf fall. This will prevent bleeding, which although it is not detrimental, can look unsightly. When pruning, make sure to maintain an even framework, step back and assess your work and prune proportionately.